At Logan’s Roadhouse® you can come as you are, be yourself and make lifelong friends. You’ll enjoy our high-quality, moderately-priced menu featuring over 30 entrees including aged steaks, hand-cut on site, mesquite-grilled chicken, fresh-ground steakburgers, baby back ribs, seafood, and specialty salads made from the freshest ingredients. And don’t forget our signature ice-cold longnecks, mouthwatering, made-from-scratch yeast rolls, and bottomless buckets of in-shell peanuts. 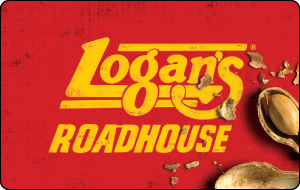 Come on in, loosen up and toss some peanut shells on the floor at Logan’s, The Real American Roadhouse®! This prepaid Logan’s Roadhouse Gift Card is redeemable for food and beverages sold at all Logan’s Roadhouse® restaurants. This card is like cash and cannot be replaced if lost or stolen. This card is not redeemable for cash, except as required by law. There are no expiration dates or fees associated with this card. For balance inquiries and all other inquiries regarding lost or stolen cards, please call 800-322-6857.